Chinese New Year 2019 is soon to be upon us. We would like to thank all of our wonderful customers for the support you have shown this year and we wish you all a great Year of the Pig. May it bring you and your families great health and prosperity. Sky International will be closed on Feb. 5th through 7th. We will be open again on Feb 8th. If you have any questions about our opening times, please Contat Us. Christmas is nearly upon us and while some of you may of been organised enough to sort everybody’s presents out we are here to help those that are still scratching their heads. We have curated a list of sailing products that make exceptional gifts for all watersport enthusiasts, be they salty sea dogs, kayakers or the more competitive sailor looking for that extra edge. The list of gifts below should be more than enough to fill even the most discerning sailors Christmas stocking. If you don’t see what you are looking for then please get in touch and let us know. We have a wide range of Henri Lloyd cruising and offshore clothing for men and women. Perfect for when the colder weather encroaches. We recommend these for any offshore racing, Hong Kong to Macau race or coastal cruising and of course the mandatory seafood restaurant jolly. Not convinced? How about 20% off the retail price? All our Henri Lloyd clothes are on SALE at the moment. No matter if you are cruising along the coast or racing offshore – you will at some point need a torch. Exposure Lights are some of the toughest, watertight and nicest looking torches out there. Just ask the crews from the Volvo Ocean and Clipper Races! We stock the beautiful and ubiquitous X2 as well as the DAME winning MOB Torch. Alternatively go for the RAW Pro headtorch with white and red light options. Want peace of mind when you are sitting at home unwrapping presents or dozing off in front of the TV? Yacht Sentinel gives you the ability to remotely monitor your boat in a number of ways. With a range of add ons you can monitor bilge water level, power status as well as internal motion sense and temperature. There is not much better than slipping into a nice new pair of deck shoes. Chatham’s range of sailing shoes covers almost all tastes of nautical footwear so you should be able to pick the perfect pair. Men’s and women’s styles available for cruising, dinghy and offshore use. Looking for something suave and sophisticated for the more classic boat owner? The Autonautic collection of weather stations, clocks and barometers is just the ticket. We stock a number of these gold plated instruments that enhance the style of your boat or room. Available on their own or mounted on a lovely wooden plinth. As a bonus, these are also on SALE. Now that Winter is upon us the temperature on the water is sure to drop massively. What better way to combat that than to grab some brand new sailing clothes. Crewsaver may of downsized their range but the new spraytops look and work amazingly. Compliment them with some longjohns and wet shoes and your day on the water will only be cool looking, not feeling. Christmas is often the time when people ask for gadgets and accessories. The Optimum Time range of waterproof sailing watches make an ideal gift or upgrade. Designed with competition in mind they have up and down timers, sync buttons and they even tell the time. With styles for the young Oppie sailors all the way up to a classy combination of leather and stainless steel every type of sailor is catered for. Looking for something to keep you warm and dry on and off the boat? The Bainbridge sailcloth jacket is a stylish nod to the modern winter jacket. Modelled on the more expensive offshore jackets thes coats will keep you warm and stylish as well as repelling water and spray. If you are wanting something more technical, we have those as well. As every watersports enthusiast knows. Glare off the water surface or looking up at the top of the mast can be a blinding experience. look no further than the ridiculously clear Kaenon’s. Kaenon are known far and wide as one of the best lenses out there for water based sports, driving as well as golf and fishing. With a range of different men’s and women’s styles we have a pair to suit pretty much anybody. For the boat owner who already has everything. We can help you perpare a fully custom and unique crew kit with any design imaginable. We can provide you with sublimation or silk screen printing as well as embroidery and heat tranfers. We can also create lovely one-off belts with the boats logo or almost any design. If you have a sailing mad member of the family why not give them something that not only looks good on the boat but on land too! Our range of Bainbridge novelty sailcloth bags includes ladies totes, duffel, barrel and even washbags. There is even a cool bag. All with random sail numbers sewn in for that extra edge. Nothing says “I’m an outdoorsy person” more than a good old Multitool. When a Swiss Army Knife just doesn’t cut the mustard, we stock a number of Gerber multitools to suit almost any situation on the water or in the woods. If looked after properly this is the kind of gift that gets passed down to grandchildren. Creating a legacy was never easier. Have an ornathologist or keen yachtie in the family? No worries, we have you covered. SILVA offer a neat selection of binoculars designed for the keen outdoors types. These field glasses will look at home on the boat, in the kayak or in a remote bothy up a hill as you wait for that elusive rare bird. Both practical and eye catching. The OverBoard range of waterproof bags and backpacks are an essential peice of kit for anyone heading on the water or outdoors. Designed to withstand rough treatment, mud, sand, snow and most importantly, water these bags stand up to the task. Simply roll the top a couple of times and you have a water tight seal that allows most of the bags to even be submerged for a time without getting wet inside. While not exactly for sailing, these beers from Box Steam Brewery make an ideal companion to any festive food and occasions. No matter if it is carols and chestnuts or the traditional Christmas dinner, one of these beers will go down well. Our sister site sells them by the case of 8 and they also offer a mixed case for those that can’t decide. You can also buy them by the bottle in our store. All of us at Sky International wish you the best for the up and coming festive season and hope you stay warm and dry(ish) out on the water! We will be putting our feet up and tucking into festive turkey, nut roast and all the trimmings whist looking for excuses to get out of the house and into a boat. Unfortunately this means that we have to close the store on December 25th and have a few days off. See below for our New Year and Christmas 2018 Opening Times. Sky International will be closed on Dec. 25th, 26th & January 1st. We are open as usual from January the 2nd onwards. If your stuck for presents then head over to our SALE to see if you can fill a few stockings! Sky International are clearing out the clothing racks! As part of our larger Red Dot SALE we are offering all Henri Lloyd sailing clothes at 20% off the full retail price. This is a great opportunity to grab a peice of amazing sailing gear. No matter if it is a dri-fit tee for casual sailing or an Offshore Elite jacket and Salopettes for the next international race. We are having a slightly delayed (or early) Spring clean to make room for new stock with a Kaenon SALE. Luckily for you guys we are discounting some of our styles that are currently in stock. We have styles on SALE with prices slashed by up to 50%! – Check them out here. Sky International will be representing the Box Steam Brewery at the Aberdeen Boat Club on Saturday the 25th August with a beer tasting at the Bombay Street Food Curry evening. While the curry is being served our four Box Steam Brewery beers will be available to sample and purchase. Beers can be purchased for consumption or cases can be ordered through the ABC throughout the night. Chinese New Year 2018 is soon to be upon us. We would like to thank all of our wonderful customers for the support you have shown this year and we wish you all a great Year of the Rooster. May it bring you and your families great health and prosperity. Sky International will be closed on Feb. 16th through 19th. We will be open again on Feb 20th. This class legal Composite Top Section is made from composite material and is lighter than the aluminium spar. The composite construction will substantially decrease damage to spars due to it not bending, greatly improving its durability. The mast is a composite of different materials, but is not a 100% carbon fibre mast. It won’t adopt a permanent bend from heavy air sailing like the old spars sometimes would, and it will not be necessary to make sure the rivets on the top and bottom line up anymore. Though some people say to line them up port and starboard rather than fore and aft. The composite mast should make your setup easier and reduce the possibility of damage, while otherwise providing the same sailing experience you had with your aluminium spar. The ILCA have stressed that while this top section is an improvement on the aluminium versions they do not offer an advantage while racing. The aluminium spar is also available & class legal as well. Help us celebrate the launch of the Henri Lloyd Marine clothing range by entering our easy competition. Simply go to our Facebook page, like us and then answer the question: What does sailing in Hong Kong mean to you and how can Henri Lloyd sailing clothes enhance that experience? The three most creative answers win. First Prize is a men’s or women’s Dri-Fit Polo, Second Prize is a pair of sailing gloves and in addition, Third Prize is a sailing cap. Check these as well as other Henri Lloyd sailing gear out here: www.sky-international.com. 1. The prizes are one Polo Shirt, one pair of gloves and one sailing cap. No purchase necessary. 2. There is no cash or other prize alternative. 3. Deadline is 15th September 2017. 4. One entry per person. Bulk, automatically generated or third party entries are void. 5. Incomplete entries will not be entered. 6. The winners will be selected from all valid entries for this competition received before the closing date. 7. The result is final. No correspondence will be entered into. 8. Winners will be notified on Facebook or using the other contact details provided by the winner 7 days of the closing date. All reasonable endeavours will be made to contact the winner during the specified time. If a winner cannot be contacted or is not available, Sky International reserves the right to re-draw another winner from the valid / correct entries that were received before the closing date. 9. If for any reason, the prize becomes unavailable, Sky International reserves the right to supply another alternative. 10. Entrants must be able to collect the prize from our Wanchai Store in Hong Kong. No prizes will be posted or be collected by agents/3rd parties on behalf of winners. Sky International acquired 4 of these boats and we are looking to share the love! You could end up owning the boat that won the Radial Worlds in November 2015! We have brought in a new batch of Kaenon styles, some new styles and the usual popular suspects, all great for sailing, most other sports and lifestyle. Check them out here: www.sky-international.com. Also, to make room we are discounting some of our older styles currently in stock – check it out here. Racing Rules Companion 2017-2020 is the invaluable on-the-water reference guide to the essentials of the racing rules, updated for the latest 2017-2020 Racing Rules of Sailing. Every racing sailor should have a copy! The book summarises the basic principles, definitions and rules and then covers every aspect of the race. This edition includes a new section on starts as well as mark rounding, obstructions, signals, and dispute resolution. Colour diagrams throughout ensure the concepts are easily understood. Splash-proof and spiral bound, this little companion stands up to frequent use and serves as a great aide-memoire that will fit into your pocket or kit bag. Written by the acknowledged rules expert, Bryan Willis. An appeals court in Belgium denied a trademark infringement appeal from a Belgian dealer and an importer and upheld a decision that favoured LaserPerformance. The Court of Appeals in Antwerp denied the appeal on Jan. 19 from Belgian dealer OptiTeam BVBA and importer Natisch Centerum Delfzijl-Tecinvest BV and upheld the original Sept. 24 decision, according to Sailing Scuttlebutt. A lawsuit against OptiTeam and Tecinvest alleged that they illegally imported and sold boats and parts manufactured by Performance Sailcraft Australia for distribution into LaserPerformance’s territories, including Belgium, the Netherlands and Luxembourg. After review by the Court of Appeals in Antwerp, the appeal from OptiTeam was dismissed and LaserPerformance has been declared the winner of the case on all points, Scuttlebutt reported. The judgement confirms that LaserPerformance is the only entity with the right to the Laser trademarks in Europe. Based on the outcome of the trial, LaserPerformance is entitled to financial compensation, assets can be seized and OptiTeam BVBA and importer Natisch Centerum Delfzijl-Tecinvest BV are prohibited from future violations, Scuttlebutt said. “We will continue to take any and all legal action against any entity who is illegally and systematically importing PSA and other manufactured boats and parts into our trademark territories that include Europe, North America, South America, Africa and most of Asia,” LaserPerformance said in a statement. To make way for new stock we are discounting most of our OverBoard waterproof case and bag collection and what better way than part of the Red Dot Sale! Browse our SALE section on this site or pop in to see us in our Wanchai store. OverBoard are one of the industries leading producers of waterproof cases for smartphones, iPhones, tablets, iPads and digital cameras etc. as well as multi use cases and bags to protect all your valuables be it at the beach, in a kayak or on board an off-shore racing boat. Many items with 10% to 25% off standard prices – look for the red stickers! Other items include kids lifejackets to head torches and everything in-between. Brands include Crewsaver, Overboard, Exposure Marine, Chatham Marine, Kaenon, Autonautic, Hobie Kayaks, Animal, Croakies and so many more. The RS Aero completely re-sets the standard for pure exhilaration in a simple single-hander. Ultra-light weight means the hull form and rigs need not be extreme, so the Aero is remarkably easy to handle, especially with three rig options which will typically suit youths, light adults and larger adults. To help introduce the AERO into Hong Kong and Macau, Sky International is offering a deal on the bulk purchase of new boats. This is an ideal opportunity for clubs to refresh their dinghy fleets or for groups of individuals who wish to upgrade their class ambitions or try something new and exhilarating. This is a one time RS AERO offer and is subject to groups and club bulk purchase. For pricing and more details please contact us directly. We’re clearing the decks to make way for new stock and what better way than a big Red Dot Sale! Browse our SALE section on this site or pop in to see us in our Wanchai store. Many items with 10% to 50% off standard prices – look for the red stickers! Items from kids lifejackets to head torches and everything in-between available. Delicious, nutritious, freeze-dried food with the highest calorie-to-weight ratio. Making mealtimes something to look forward to. Sky International are proud to announce that Expedition Foods are now available to purchase through our store. These food packs are perfect for offshore racing as well as boat deliveries or any adventures where space and cooking utensils are a premium. Expedition Foods offer a rather tantalising range of freeze dried meals (better than dehydrated). From simple spag bol to mouth watering curries and desserts such as custard with berries delicate and demanding palettes are considered. All dietary requirements are catered for as well as very high and standard calorie packs depending on the kind of adventure you’re going on. 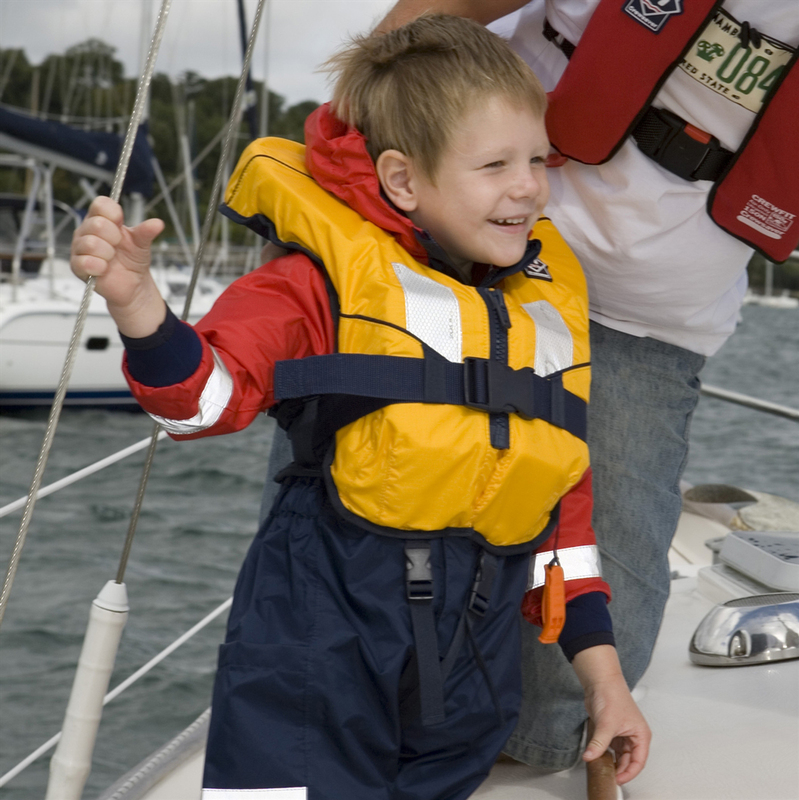 It is always recommended that children and adults wear a lifejacket or buoyancy aid while on or near the water. And of course it is easier to encourage your child to wear one if they see that you’re also wearing one! This guest article from Crewsaver offers advice on how to keep your loved ones safe on the water. When choosing your child’s lifejacket, make sure it’s the right one for the environment. The Crewsaver children’s lifejacket range includes gas, foam, and combined air foam options – and what you need depends on the child’s size and what water based activities your child will be taking part in. For example, when offshore sailing, Crewsaver recommends a lifejacket that has a higher amount of buoyancy and a harness point. The Supersafe 150N lifejacket, which has both these features, would be a great choice for this type of sailing. The Spiral, which is a 100N, non-harness lifejacket would be a good option for inshore sheltered environments and is aimed at activities that do not require the use of a safety line. These ropes are ideal for Laser and similar boat style mainsheets. Specially designed to be as tangle free as possible. The Euro children’s 150N lifejacket has everything to keep your child safe around water whilst remaining comfortable to wear and play in all day. The perky marine design ensures your child will find the jacket as fun as you find it reassuring. A top of the range safety solution for offshore, coastal and inshore use.